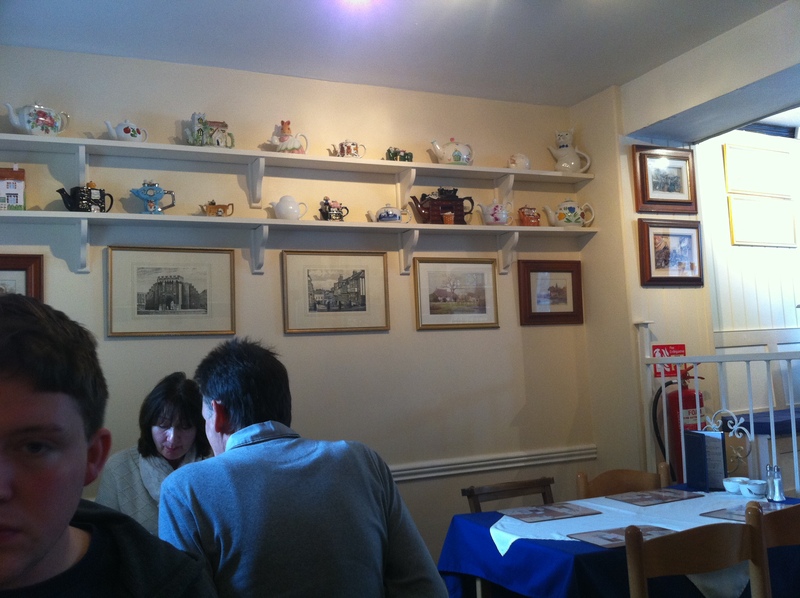 Now, my review of this delightful New Forest tearooms is going to be quite obviously biased because…my parents own it! But I realised I’ve never mentioned it on the blog and it is a big part of mine and my families life so this needed to change. Me and Ben travelled to Milford-on-Sea last Sunday to visit Polly’s for the first time, embarrassingly, in about a year. It was also the last day of the Milford-on-Sea Food Festival so we wanted to catch the Farmers Market and general shennnanigans that were taking place on the Village Green. We arrived in a very windy Milford about 1pm and after a cursory glance at the market decided to head for the warmth of Polly’s before we tackled the stalls. My Dad works full-time at Polly’s and is the resident chef, manager and general jack-of-all-trades. Because Sunday was expected to be a busy day what with the Food Festival and all, my Mum also came down with him to work for the day. So it was a real family affair! 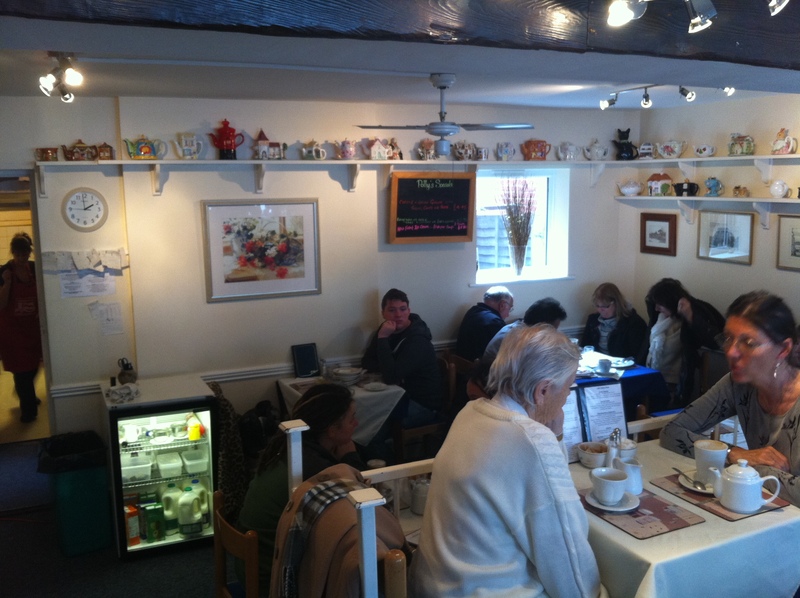 It was absolutely heaving when we walked inside but we were able to squeeze onto a table for 4 at the back of the tearooms which was later switched to a table for 2 after I offered to swap with 2 ladies who were meeting friends. 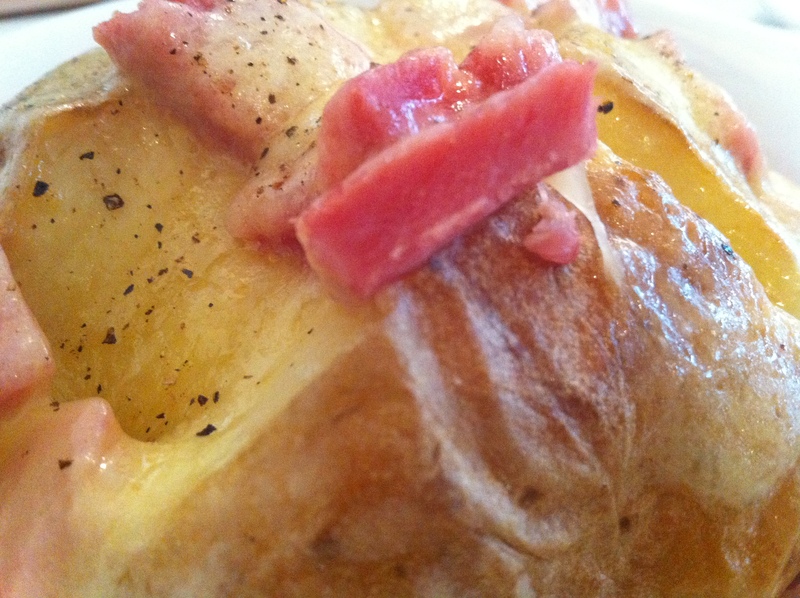 Polly’s serves a full breakfast menu til 12 noon (Full English’s, sausage and bacon baps, scrambled eggs etc) and then an extensive lunch menu which includes jacket potatoes, sandwiches, baguettes, panini’s, omelettes and hot meals like ham, egg and chips. I was torn between a hot, buttery baked potato and a simple chicken mayo baguette. 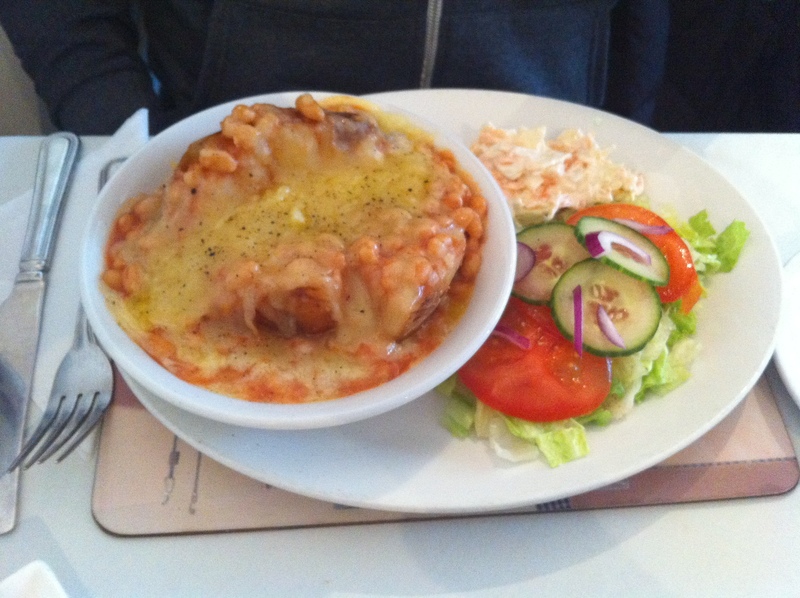 In the end the jacket potato won out and we actually both ordered them; mine with ham and cheese and Ben’s with the classic combo of cheese and beans. 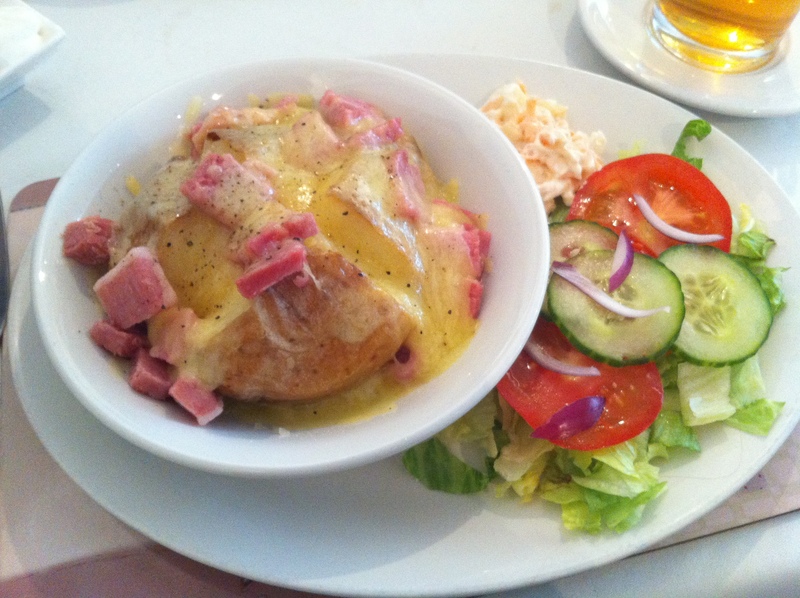 My Mum scolded me as a ham and cheese jacket potato is not TECHNICALLY on the menu but if you remember from the Morgan Christmas 2011 post, my Dad does a mean baked ham and quite frankly it would have been rude not to sample some. I took some photos of the interior as we waited for our lunch – as I said before I am biased but I think it is so pretty! 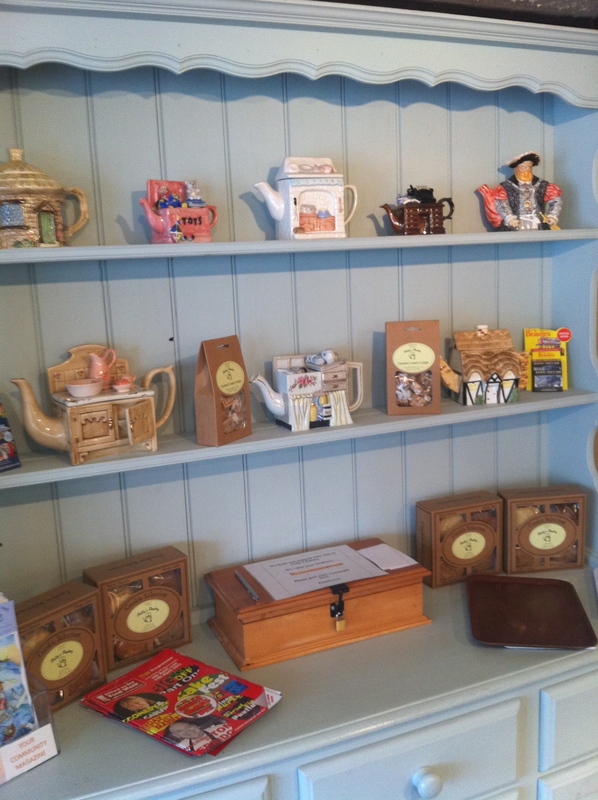 There is a collection of vintage teapots on shelves all around the tearooms which always get lots of attention and admiring looks from customers. As a bit of a treat our lunch was brought out by the Chef himself! Very exciting, I like to think he only does this for extra-special customers. 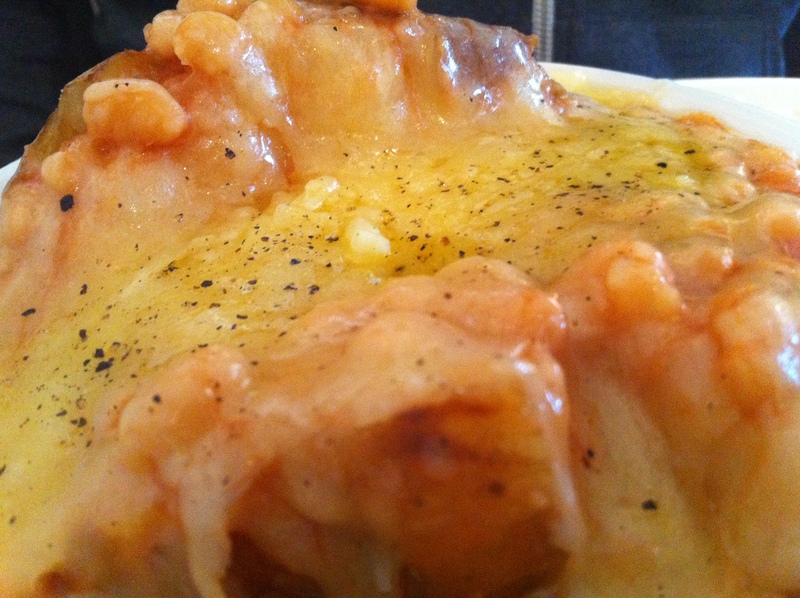 Here is my jacket potato…I think the photos speak for themselves! We were especially impressed with the generous portion sizes! I loved that we got sides of salad and coleslaw as they paired perfectly with the potato and helped make the dish more of a meal. Needless to say, we were absolutely stuffed afterwards and I’m ashamed to say I couldn’t even finish it! I picked out all the ham and ate it though. Obviously. 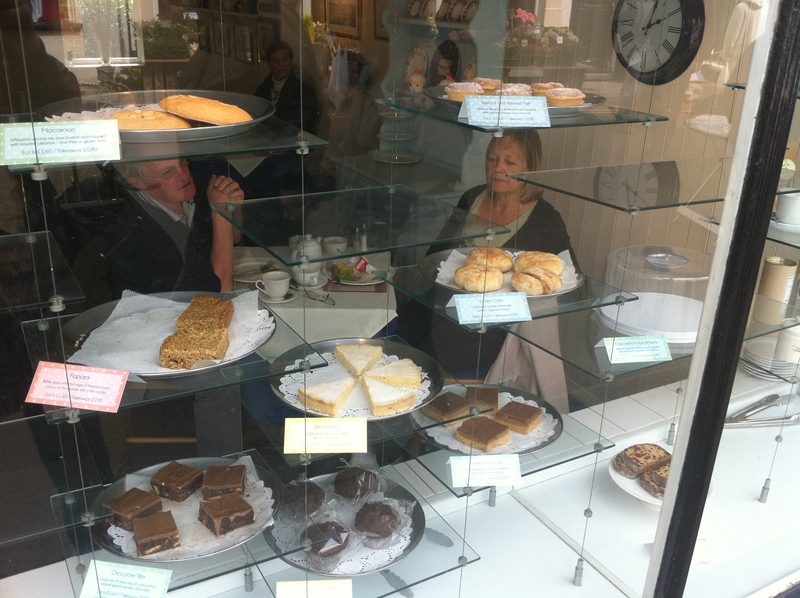 I seriously was gutted that we couldn’t manage dessert as Polly’s is world-renowned (ish…) for it’s cakes and sweet treats, many of which are displayed proudly in the windows causing serious pedestrian hold-up. I would (obviously!) 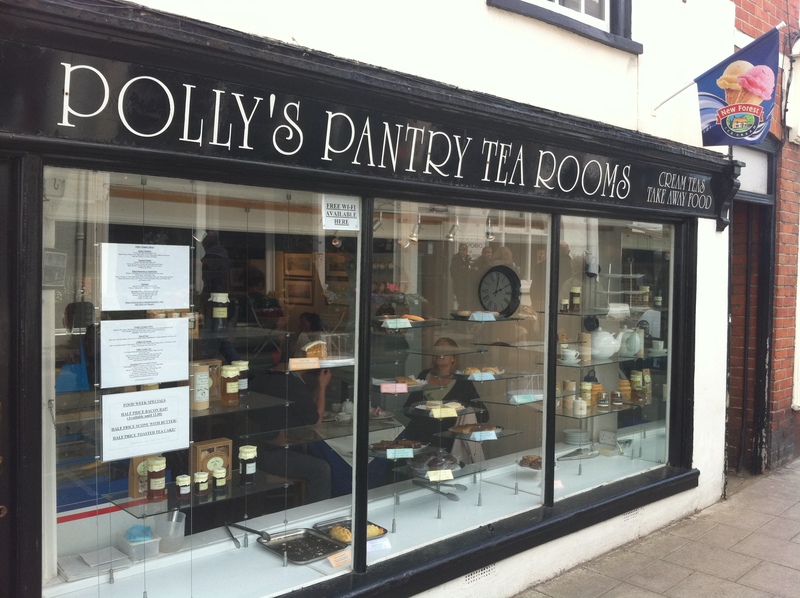 recommend Polly’s Pantry but I hope you can see past my honestly biased review and choose to visit based on the quality of food shown in my photos. 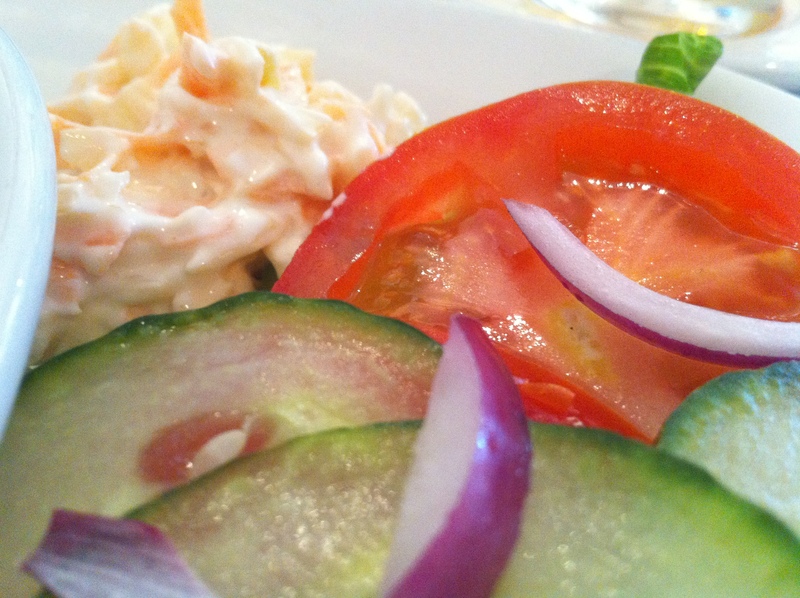 Our lunch was delicious but I wish I had taken a photo of the cream tea – two huge homemade scones with vats of clotted cream and jam to slather all over them, plus a pot of tea, with change from a fiver – the cries of delight from customers as they receive their plate says it all! We’d been wanting to try this new Italian restaurant for ages but only got a chance last Thursday, a good excuse to celebrate the start of the long weekend! We went for drinks in the newly refurbished Crown Inn beforehand – absolutely beautiful inside and worlds away from it’s previous incarnation – I actually struggled to believe it was the same pub once we were inside! Definitely worth a visit if you are in the village and the perfect place for a cozy glass of wine before dinner. We arrived at Piccola Roma about 8pm and it was very quiet in the small restaurant with only a couple of tables occupied. The lovely owner greeted us and said we could pick any table we wanted, a huge bonus in my book! We chose a little table for two right in the window and ordered a glass of wine and a beer. 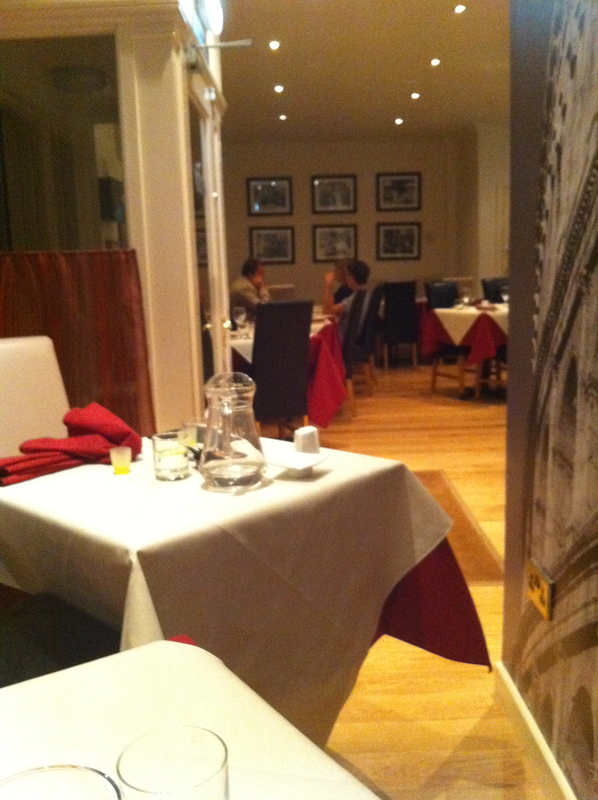 The decoration is really lovely inside with dimly lit tables and a generally romantic atmosphere. There was a couple on the table next to us and a family on a larger table near the door. 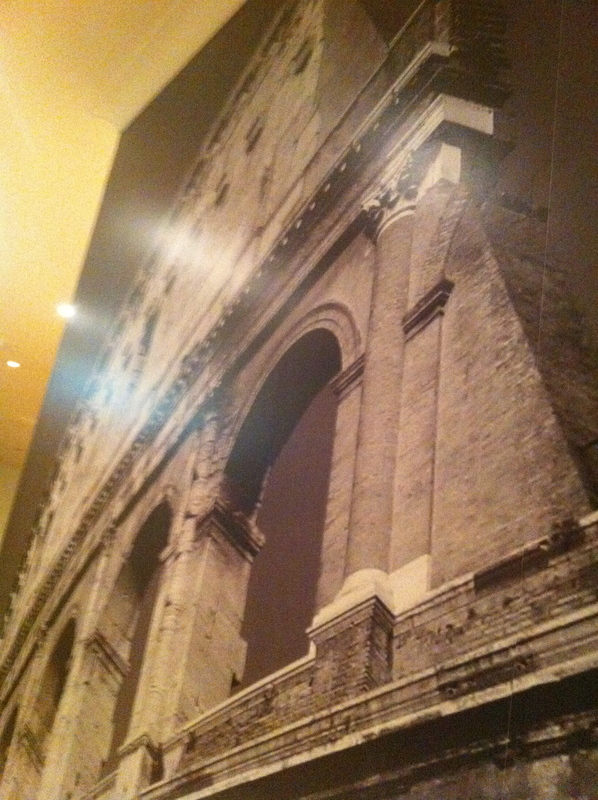 There was a huge print of the Colosseum stretching over the wall next to us which got us chatting about how much we’d like to visit Rome one day. We perused the menu first and decided to share a couple of starters in order to leave room for what sounded like a stellar line-up of main choices. We ordered mixed olives and the bruchetta. Both came out looking magnificent! 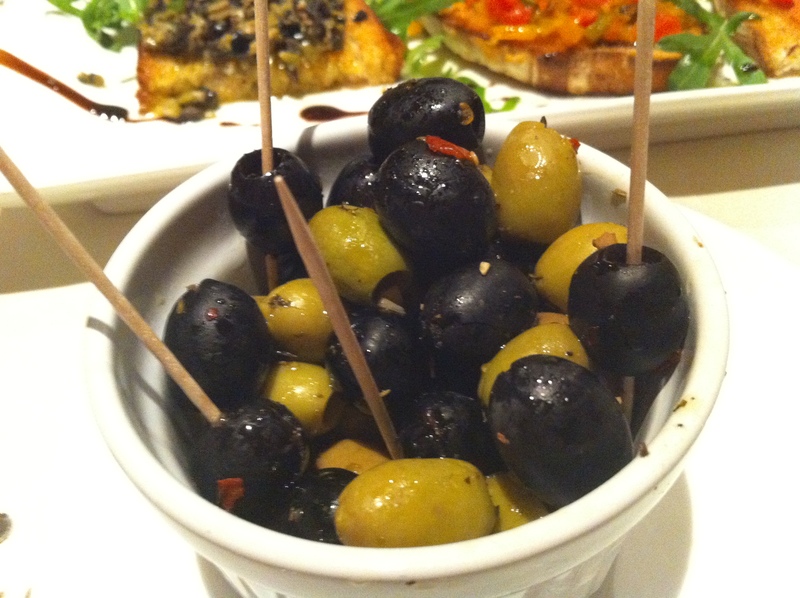 The olives were perfect – fat, pitted and doused in a flavourful garlic, chilli and herb oil. 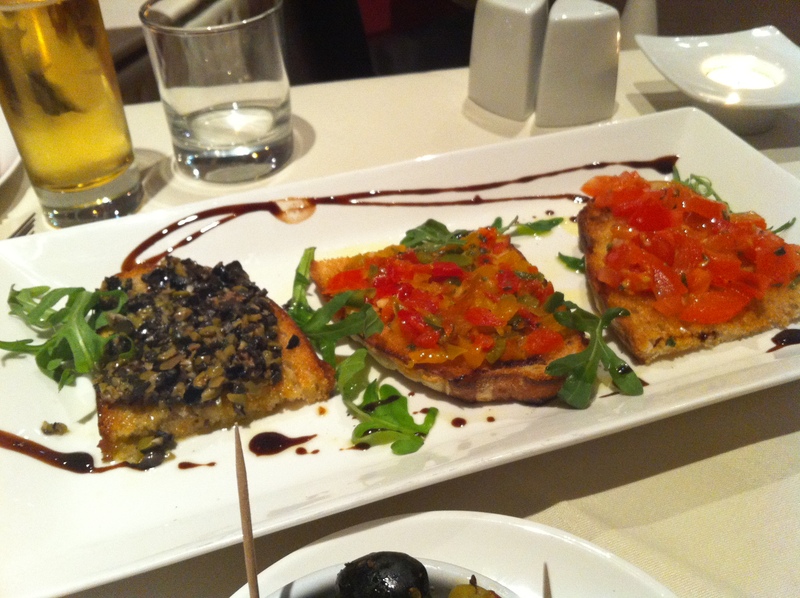 The bruchetta was presented as a trio and we halved each one to ensure a complete tasting experience. My favourite was the chopped olives – perhaps an olive overdose for some given our second starter but the intense olive hit was just perfect teamed with the crispy grilled bread. The mixed pepper and sliced tomato bruchetta were also lovely and we obviously scraped the plate clean of balsamic glaze. I was having some trouble deciding what to order for my main and was stuck between a having a bowl of cheesy, creamy, comforting tortellini or just going for it with a massive steak. The owner came over and chatted to us for a bit and eventually I plumped for the steak after she declared it “the best I’ve ever eaten!” Obviously biased but I’m not going to let a declaration like that pass me by and before I knew it I’d ordered it, medium rare please. 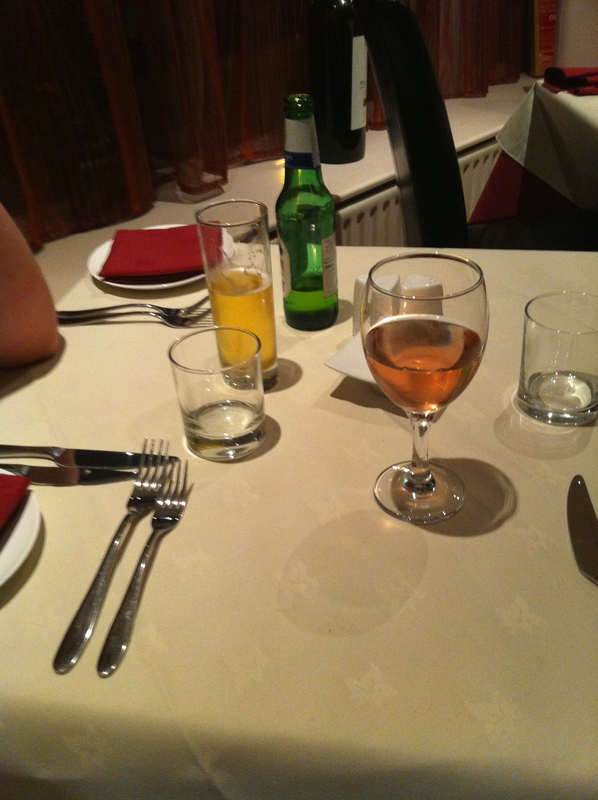 Ben was absolutely spolit for choice at this restaurant and had a choice of at least 3 different main courses! We had seen on the online menu that they served an aubergine parmigana which he was quite keen to try but after asking our server we learned it had been taken off due to lack of interest. Unfortunate but understandable. In the end he went for the pesto pasta with a side salad of onions and tomatoes. 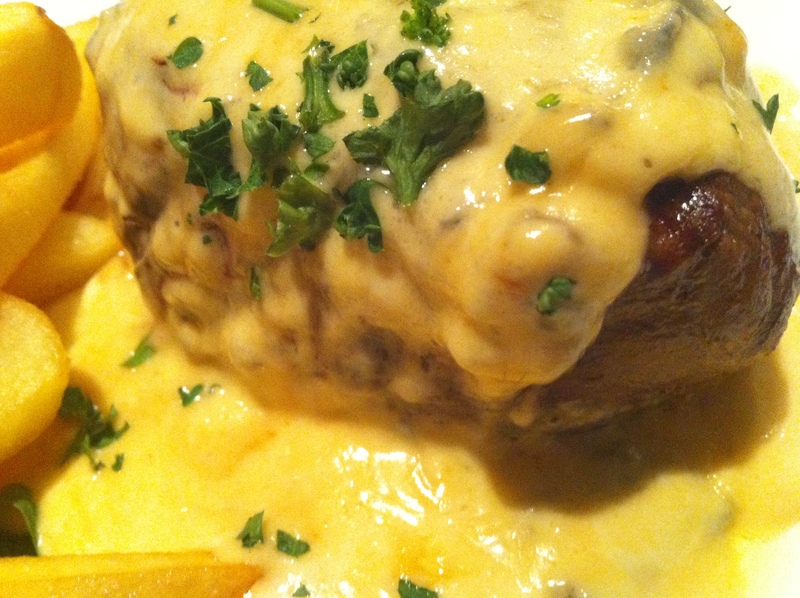 Our main courses were brought out and I literally could not have been more excited to see the sheer size of my steak. Ben said as soon as he saw it he knew we’d be coming back! 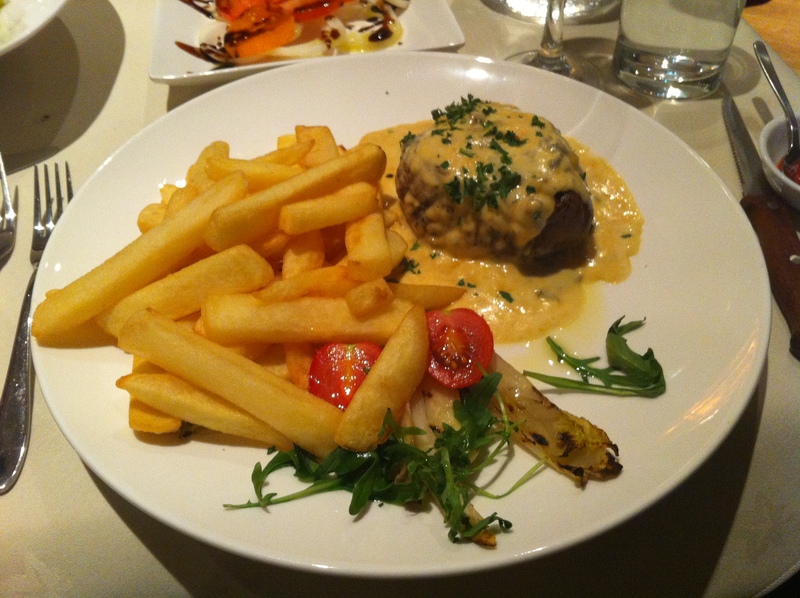 It was a 10oz rib-eye steak with a creamy dolcelatte sauce, chips and a salad. I have recently become obsessed with blue cheese and have been adding it to pretty much everything I eat so the chance to have a steak slathered in it pretty much made my day. We were both impressed because I have only ever had a steak like this in Florida – sitting proudly on the plate, taller than everything else. Normally I get a bog-standard sirloin or similar which, while delicious, cannot match the impressive appearance of a fillet or rib-eye. The steak was perfectly cooked and in fact next time I may have to chicken out somewhat and order it medium as the thick, meaty centre was very very rare. As it should have been! Only I wasn’t expecting the sheer girth of it and overcompensated thinking they would err on the side of caution. The insanely rich sauce complimented every single bite of the steak. I was so tempted to ask for more sauce (pretty much to just drink) but I remembered I am actually on a ‘diet’ (using the MyFitnessPal app, it’s amazing!) 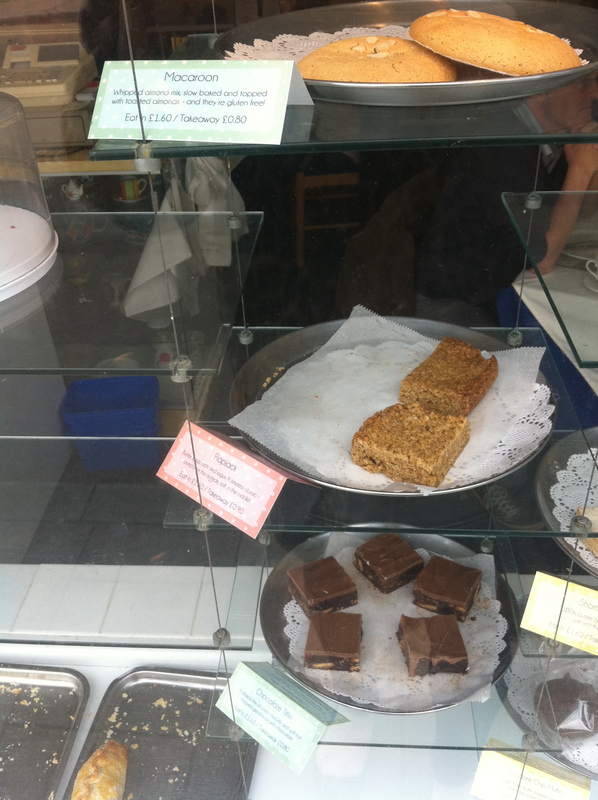 and although we had walked to the village and so burned an additional 300 odd calories, I really shouldn’t push my luck. As it was I really scraped my plate clean, using the chips more as a vehicle to get sauce into my mouth than a side dish in their own right. They deserved more than that really as they were lovely chips. Ben was very happy with his main course and although it appears quite small and forlorn in the vast bowl, he was actually struggling to finish! 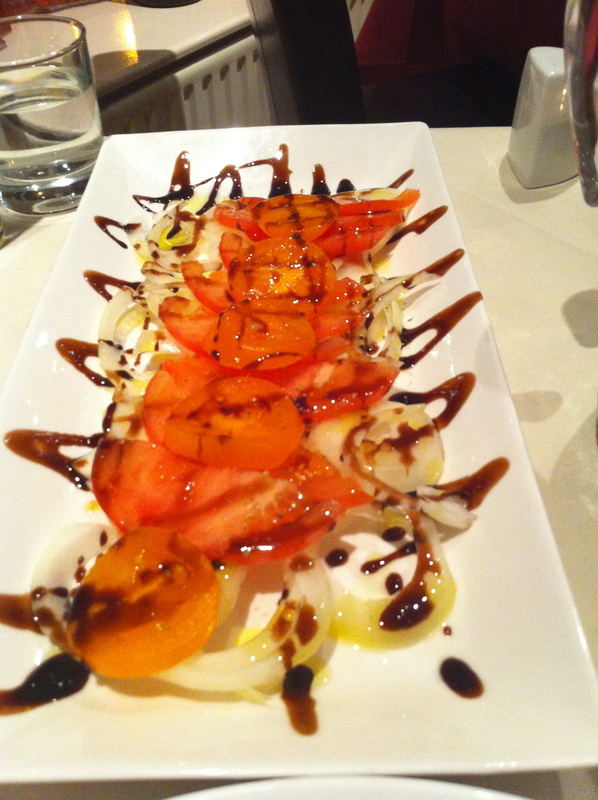 His side dish of onion and tomato salad was somewhat resplendent in appearance and rather stole the show from his main. More balsamic glaze, score! He was pleased because the pasta was cooked al-dente (they actually state this on the menu and you can ask for it to be cooked longer if you prefer) and the pesto was fresh and flavoursome. 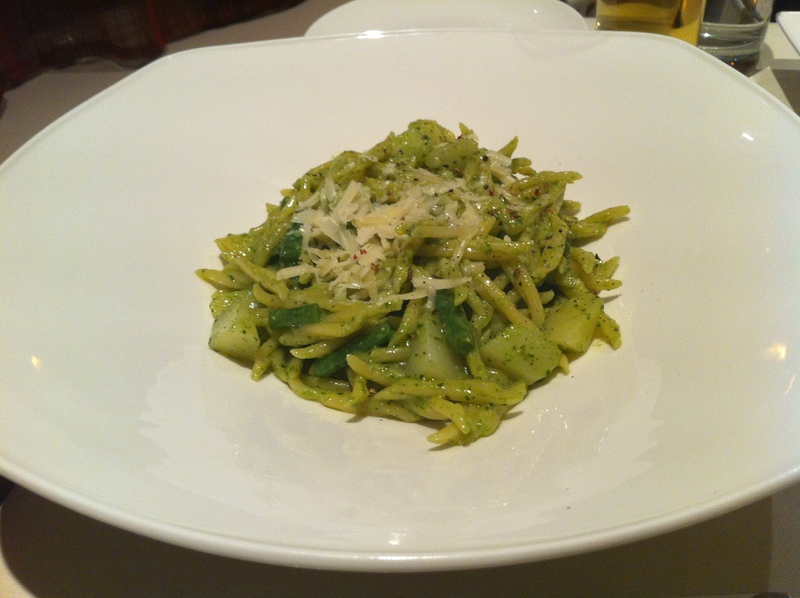 The salad provided a lovely contrast to the pasta and helped break up the unavoidable monotony that afflicts most pasta dishes. We were contentedly full after our main courses and I was pleased we had shared a starter (although does it really count as sharing if you order 2…) and happy to leave without dessert in order to avoid the wrath of MyFitnessPal. Our dinner came to £42 which we thought was really very reasonable with a drink each and starters. Saying that, I did order the most expensive thing on the menu so we could have quite easily kept costs down if I’d gone for the tortellini. Oops. 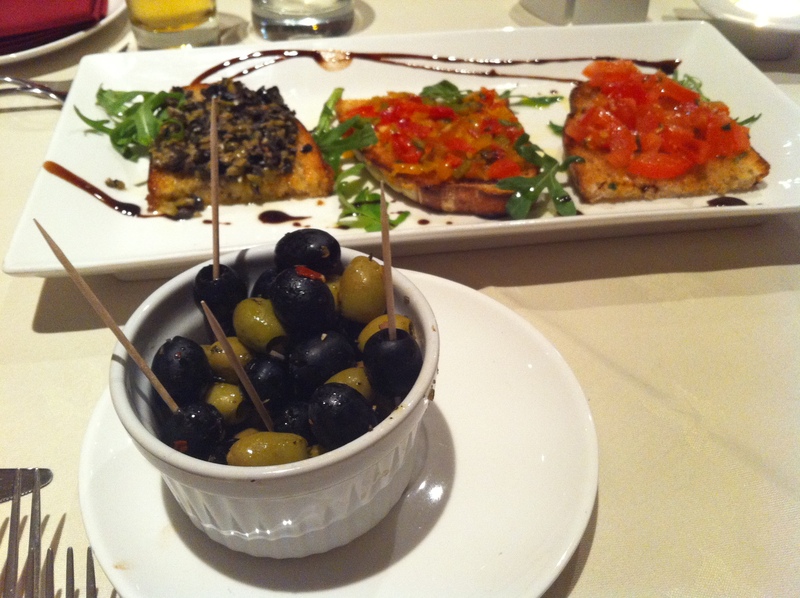 We will definitely be going back to Piccola Roma given it’s fantastic food, convenient location and friendly service. The owner was very pleasant to chat to and we learnt that she lived in Rome for 6 years and actually met her husband there, the chef at Piccola Roma! Fantastic to hear we were receiving real authentic Italian food and for me, lovely to hear the back story from someone who is so obviously passionate about Italy and Rome.